As soon as I saw that Essie made a nail polish called 'Trophy Wife,' I knew I needed to get it. Then I saw the color and was disappointed with it. I'm a pink girl (go figure, right?) and not into blues. Then came Hurricane Irene. We were in Virginia Beach on vacation and killing time in Target waiting for the electricity to be turned back on at our rental. And while strolling through the nail polish isle I saw this baby and knew I needed to get it. 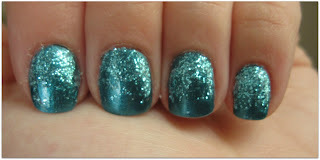 This is 2 coats of Essie 'Trophy Wife' and I used my glitter sticks from Martha Stewart on top. I use a simple paint brush (from a $5 bag of them from Michael's,) squeeze some onto a paper towel, dip the brush into it, and simply swipe from the cuticle up. By the time I reach the tip of my nail, the glitter is distributed in a gradient manner. Cool manicure. The sparkles definitely turn it into something special! Loving the color. Sparkles always draw my eye! So pretty! I love the color and the way you did the glitter. La-la-love this color! The glitter makes it! Thanks ladies!! I too am a glitter freakazoid!!!! I love the look with the glitter. What a fresh idea. I love how you did the glitter - I don't think I've ever seen that before. It's so smart! And your blog is so charming and sweet - I love it! Thank you ladies!! I swipe the glitter glue with a regular old cheap paint brush from a craft store after dipping it into a dollop of glitter glue. Martha Stewart glitter glue. That is soo cool! Gonna have to try it in a few months once I can control and wear nail polish again (carpal tunnel surgery on my hands has stopped nail polish wearing for now). Love love love this look with the glitter! I've had my eye on those Martha Stuart glitters. Now I really think I need to have them. Must try this!